When it opens in spring 2018, the Doctor of Nursing Practice (DNP) degree program will represent another important addition to the academic portfolio of the UC San Francisco School of Nursing. We believe the need for a DNP program like ours – the first such program at any University of California campus – has never been more urgent. Amid this period of rapid change and uncertainty, one thing has remained constant for our health care system: We must develop and refine more effective care delivery models to support the goals of greater efficiency and improved health outcomes. To that end, the Health and Medicine Division of the National Academies of Sciences, Engineering, and Medicine (formerly the Institute of Medicine) has, among other things, called for increasing the number of doctorally prepared nurses. DNP-prepared nurses are a critical part of this effort, because their skill set enables them to do everything from leading within health organizations to implementing and evaluating quality initiatives and participating in translational research that addresses complex health needs. The increased demand for DNP-prepared nurses also means that very visible schools like ours must leverage our strengths – and the strengths of this entire health sciences campus – to bring innovative approaches that guarantee a quality education and new opportunities for our students. Our hybrid program design includes fully online core courses and small-group, scholarly, project-focused courses that use a variety of distance-based teaching strategies. Three in-person immersions at the beginning, middle and end of the program will build a learning community through peer-to-peer and student-to-faculty interaction and collaboration. Students proceed through the curriculum as a cohort, but the design is flexible, so they can support their educational goals while continuing to practice. Even as they’re exposed to evidence- and research-based clinical practice and interprofessional skill building, students will choose elective courses that develop expertise in areas such as educational leadership. Because our evolving health care system needs more nurse leaders in clinical, administrative, health policy and educational roles, DNP programs are growing nationally, and the American Association of Colleges of Nursing (AACN) recognizes these programs as the terminal level of preparation for nursing practice. It is an ideal time for UCSF to introduce our version of a DNP program. 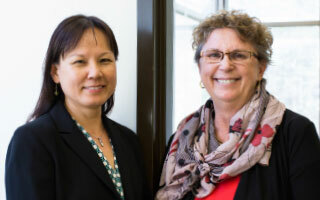 Jyu-Lin Chen is director and Annette Carley is associate director of the DNP program at UCSF School of Nursing. To learn more about the program, email us at [email protected] or visit https://nursing.ucsf.edu/academic-program/dnp-nursing.